Julie Kedzie has announced her retirement from fighting following her split-decision loss to Bethe Correia at UFC Fight Night 33 in Brisbane, Australia, on Friday night. While we will no longer see her in the cage fighting, Kedzie will take up a role in MMA using her knowledge to help other fighters progress through the ranks. The 32-year-old, who trains out of Jackson/Winkeljohn MMA in New Mexico, retires with a record of 16-13. 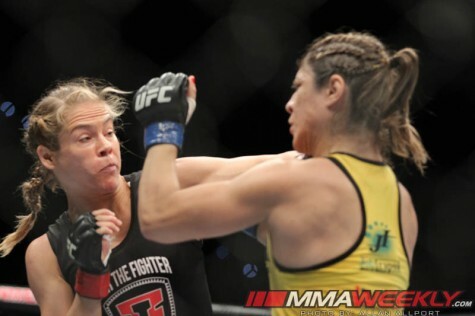 She has fought the likes of Miesha Tate and Alexis Davis in her four fights under the Zuffa banner, with her fighting career stretching back to 2004. “I really truly want to thanks all of you for being a part of my journey as a fighter. I will still be involved in MMA for the rest of my life, but now it’s time for me to accept that I can give more to the sport by stepping back and taking role in helping to develop other fighters,” her tweets continued.